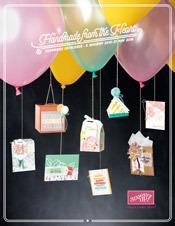 Yes, today is the launch of the brand new Occasions catalogue and Sale-a-bration brochure. Click below to open each one and view all the amazing products available! Today I share with you, the new It’s My Party Designer Series Paper. How beautiful is this?!!! Here is a card I have made using this DSP. It also features the Balloon Celebration stamp set, Balloon Bouquet Punch and the Hello stamp set (Sale-a-bration) which you can choose FREE with any $90 order. If you purchase this paper pack, the Balloon Celebration stamp set and the Balloon Bouquet Punch, you can also have the Hello stamp set for FREE! It’s that simple! This card was so simple to make but is colourful and elegant for any birthday celebration!! !